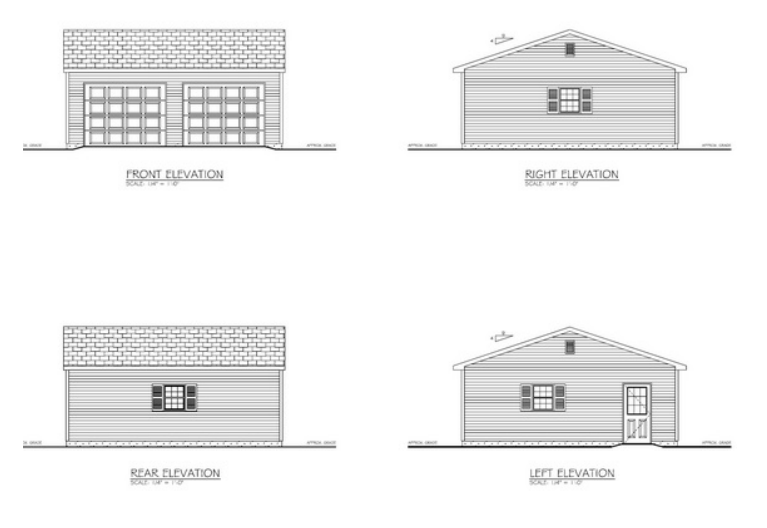 Â Â (1)-36â€ fiberglass, insulated, raised panel entry door with a 9-lite glass and (2) 9â€™wx7â€™h raised panel garage doors or (1) 16â€™ x 7â€™ garage door (your choice). Â Â Our standard siding is a double 4.5â€ Dutch Lap vinyl siding we use GAF-Timberline, high definition, lifetime architectural shingles. Â Â Our standard engineer roof truss starts with a 4/12 pitch. Window and door locations are your choice as is roof ridge direction with either the gable facing forward or the eave side facing forward. Using our standard original garage to start you can change things to fit your ideas for a dream garage. You can change the pitch or rise from our standard 4/12 to a 5/12, 6/12, 7/12, 8/12, 9/12, 10/12, 11/12 or 12/12 pitch. The pitch or rise is how many inches per foot the roof rises. For example an 8/12 pitch truss rises 8â€ for every 12â€ (foot) of roof. That would be twice as steep as a 4/12 pitch/rise. Any truss pitch/rise 6/12 or greater can add an optional attic package. The attic package comes with stairs and a Â¾â€™ tongue groove floor which is rated for storage and or apartment space. *check with your local zoning department about restrictions for living spaces above garages* Also trussâ€™s with a pitch/rise of 8/12 or higher come with 2-additional windows and standard pine-box staircase with railing. 6/12 and 7/12 pitch/rise attic packages include a drop-stair case. Our standard â€œAâ€ dormers are available in either 4â€™ or 6â€™ widths and come with (1) window. These are functional â€œwalk-inâ€ dormers. A wider â€œAâ€ dormers and shed dormers. Shed dormers have a flat roof and typically stretch along most of the width of the roof but can be built in any size you like. you may consider are glass in the garage doors, insulated garage doors or Carriage style garage doors. If our vinyl siding does not match your home you can supply both a manufacturer specification and color or send a sample to our production facility for to us to try and match. The same goes for the roof shingles. 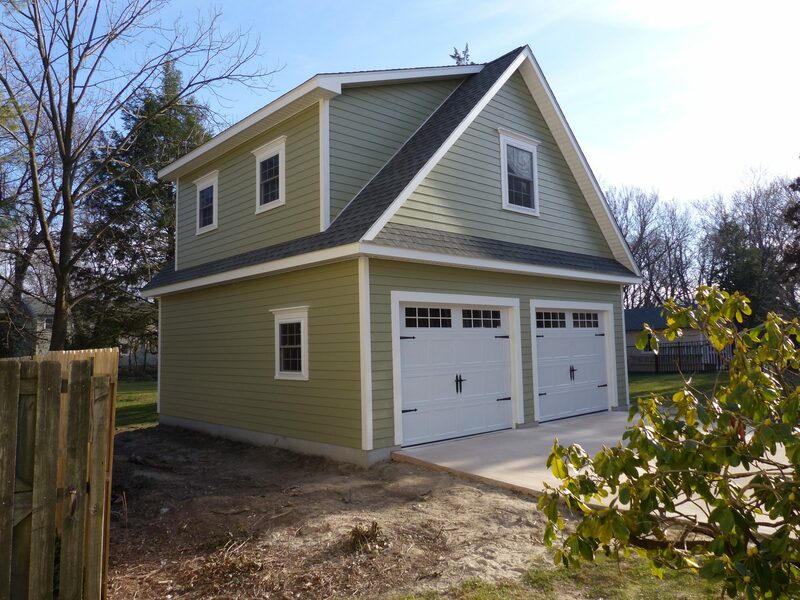 We do offer other siding choices such as LP Smart wood lap, Hardie Plank or painted T1-11. Garage door openers, bigger windows, more windows, wider and or taller garage doors, 12â€ overhangs on the gable soffits, thicker oncrete floors, window trim instead of shutters. The list goes on to items you may want but we have not listed.. This garage has almost all the upgrades we offerâ€¦. Get started with your Amish Built Garage Today!